Hattie Big Sky by Kirby Larson. Delacorte Press, 2006. Currently Available. Face Value: This is a totally respectable historical fiction cover, in that it makes no secret that it is, in fact, set in the past. There’s no headless girl or fancy dress that would have been useless on the frontier. The image of Hattie, with her back to us, looking out at that wide expanse of prairie sets just the right tone. Does it Break the Slate? Yes! Goodness yes. Hattie is that terrific kind of Slatebreaker who possesses just the right balance of skill, willingness to learn and pluck to survive, stand up for herself and figure out what kind of person she wants to be. It’s no secret that surviving the frontier was not for the faint of heart and for a sixteen year old girl to take that on herself, there’s bound to be some Slatebreaking qualities at her core. Who would you give it to? If our blog theme for this week appealed to you add this to your reading list. Hattie Big Sky gives us all the classic elements of a Frontier Girl while telling us a totally new story with a compelling character. Review: It’s 1918 and we’re in Iowa. Orphan Hattie Brooks has been passed off from one relative to another since she was little. She’s never lived anywhere that felt like home. So when a letter arrives, stating that her uncle has left his claim. With nothing to lose, Hattie sets off for the Montana prairie. She arrives in Vida in the middle of winter, and has to rely on her new neighbors and her own strength to survive and make her claim viable. With World War I in the backdrop, Hattie has to battle not only the elements of nature in forging her claim, but contend with the prejudice and fear that is brewed on the homefront. The importance of friendship while homesteading is driven home again and again. The neighbors Hattie meets and becomes close with are essential to her survival and success in Vida. The Mueller family is particularly well drawn and, as readers, we love them just as much as Hattie does. It also gives us a chance to see her internal strength – when the Muellers are persecuted by the community for being German, Hattie doesn’t question standing by her friends. As mentioned above, Hattie is both the quintessential Slatebreaker and a classic Frontier Girl. Her self-determination makes her well suited for the difficult life she has ahead of her as a homesteader and the insurmountable odds against her only give her more motivation to succeed. All the classic frontier elements are here: baking bread on a wood cookstove, venturing into town for dances at the schoolhouse, terrifying blizzards where you tie a rope to the door to get to the barn, etc. and we revel in watching Hattie handle all of these new elements of her life. But unlike Laura, Hattie wasn’t born to this life, accepting the dangers and joys of the prairie as a given with the support of a loving family. Hattie Brooks has made the choice to be here, and she is responsible for her own success and survival. That makes her successes all the more thrilling and her failures that much more devastating. Because another thing that Larson does well is that she doesn’t make Hattie’s abilities too magical. She has a lot to learn about homesteading and she doesn’t do everything right. We understand though, how capable this girl is, and that she is pushing herself to learn everything she can and do what she needs to do. We cheer for her when she finishes laying her fence and rejoice when she defeats a challenge to her claim. But it doesn’t work out. Ultimately, she is not able to meet the requirements, and she loses her claim. It’s hard to see this happen, but we don’t leave this book reeling from Hattie’s failure. We’re excited about the potential for her future. 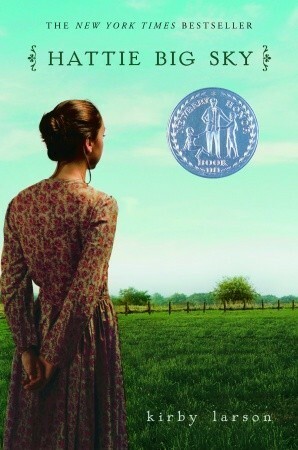 This entry was posted in Reviews, Theme Week, Young Adult and tagged Friendship, Frontier Week, Historical Fiction, Homestead, Prairie, Survival, World War I. Bookmark the permalink. as many of the super problematic themes we’re encountering in a lot of the older frontier literature we’ve been reading this week.